Students of the master’s program Information Systems have been successful with the project “Cownect“ at the local qualifying round of this year’s Accenture Campus Innovation Challenge 2017 at the University of Liechtenstein. Christian Huck, Maria Karu, Jan-Peter Kucklick und Harry Tobias Riegger could convince the jury members Jörgen Swensån, Solution Architect at Accenture, Dr. Theresa Schmiedel, Assistant Professor and Module Supervisor, as well as Roope Jaakonmäki, Executive Director of the master's program Information Systems und PhD student, both at the Hilti Chair of Business Process Management of the University of Liechtenstein, with their project “Cownect – Farming of the future” and prevail against seven other student teams and their innovative and also very professionally developed solutions. Thereby, they get the chance to compete in the regional final in the middle/end of June 2017 against the winning teams of other top universities in Zurich. The Accenture Campus Innovation Challenge (CIC) is a competition, where the renowned consulting company asks student teams from Germany, Austria and Switzerland in cooperation with their universities to work on a case study and present the results in a multilevel competition. From idea finding to prototypical implementation to presenting in front of a top-class jury, the teams run through all phases of a project. This year, the challenge is all about digital technologies, that can change our life sustainably. The students need to develop an innovative concept about the “workplace of the future“. The winning team of the University of Liechtenstein developed with the project “Cownect“ an idea on how “Farming of the future“ could look like, where for example collars measure the temperature and pulse of cows and thereby tell the farmer automatically the cows' state of health – this could mean enormous time savings for daily farming operations. Also Dr. Theresa Schmiedel, Assistant Professor at the Institute of Information Systems and Supervisor of the module Innovation Lab II in the master’s program Information Systems was impressed by the project of the winning group: “Cownect is a perfect example on how the workplace of the future could look like and how digital technologies could help us to make our lives as simple as possible as well as to improve our health, security and independence. 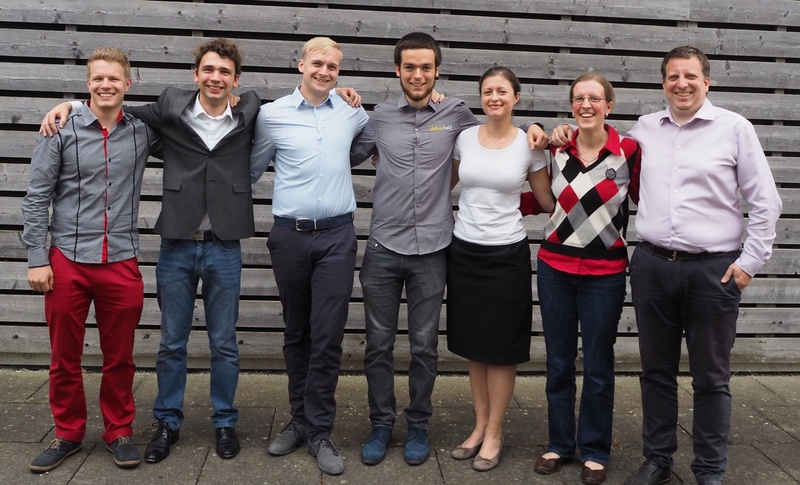 Congratulations to Christian, Maria, Jan-Peter and Harry Tobias for winning the local qualifying round!” Fingers are crossed for their presentation in Zurich at the regional final. Hopefully, they can follow their colleagues from last year (Note: the team “Promena“ of the University of Liechtenstein won with the project “Smart Waste Management“ last year’s international Accenture CIC in Kronberg at Frankfurt/Main) and even make it to the international final!